You haven’t seen and experienced Europe if you haven’t visited Netherlands and Belgium! These little countries will bring out the ‘girlie fun element’ in you. 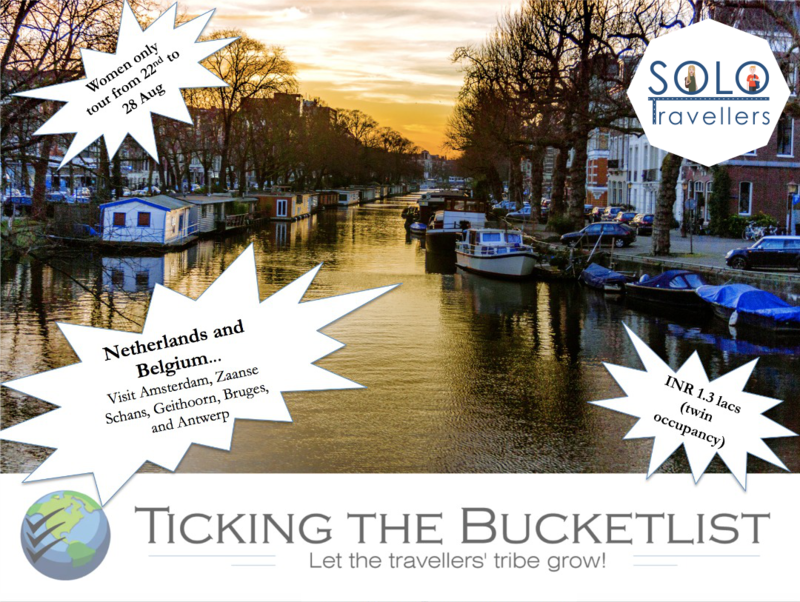 So, hop along and join Ticking the Bucketlist on our adventure to these little jewels of Europe from 22 – 28 August. This tour is being led by Leena Bhatia, an ex-banker who has been to over 20 countries. Leena is an IIM Lucknow alumnus (2003) and loves to explore the world. She loves to have fun, and will make sure that you have fun too. With Leena around, you need to forget your worries and focus on having a good time. She will also have a local guide in Europe who will accompany the group on tours and will share the local knowledge to answer all queries that pop into your mind! Rest for a few hours and then set off to see the beautiful canals and lit up city cruise. During this relaxing cruise you can enjoy lively Amsterdam from the water! Especially during the summer season, Amsterdam is bustling with people. 20.15 End of the canal cruise and transfer back to the hotel. 10.30 We start the day with a refreshing walking tour around the city with our guide (around 90 minutes). You will see all the highlights of Amsterdam, for example Dam Square, Begijnhof, the flower market, the Anne Frank House (from outside) and the famous Amsterdam canals. – Van Gogh Museum, where you can enjoy famous artwork of Van Gogh and other painters. 20.45 Transfer to the meeting point of the Red Light district tour. We end the day with an interesting walk through the famous Red Light District. 22.30 After a complimentary drink (after our tour) we depart back towards the hotel. 10.15 Start guided tour at Zaanse Schans. During the 1 hour walking, you will witness the well-known traditional Dutch old windmills next to the water. You’ll see a clog workshop, taste cheese in a famous cheese farm, and you even get a chance to see (and climb) one of the old windmills. 11.30 Time to have lunch (60 minutes). After lunch we depart from Zaanse Schans to the old fishing village Volendam. 13.30 Arrive at Volendam and we‘ll start with a guided walk along the old fishing harbor of about 45 minutes. 14.30 Departure to the (a former Island) Marken by taking a ferry. On the way, enjoy the sea breeze and the incredible view. There we will visit the old town and enjoy a small walking tour around this area. 16.00 Arrive at hotel in Amsterdam. 10.30 Arrival in Giethoorn. We start a guided tour through Giethoorn (30-45 minutes). Giethoorn is a little village with a little more than 2000 inhabitants and is also called “Little Venice”, because transport is mostly done by boat in the canals. -Take an electric powered boat and sail for yourself along the canals (60 minutes). 13.30 Transfer to Batavia Stad. 14.30 Arrival at Batavia Stad, a shopping outlet with more than 100 stores! 17.00 Time to head back to Amsterdam. 18.00 Arrival back in Amsterdam. 7.30 Pick up from hotel and transfer to Bruges. 10.45 We start the day with a 90-minute city walk around Bruges. Because Bruges is a very historical city, there is a lot to see in the city centre, for example the Big Market, the belfry, the beguinage, the Our Lady Church and lots of other interesting and beautiful things. 15.00 Arrival in Antwerp and start of the walking tour. 16.30 End of the walking tour. There are enough places to take a rest and drink a nice cocktail or one of many Belgian beers. You can also go shopping if you like – the Meir is the biggest shopping street in Antwerp. 18.00 Transfer back to Amsterdam. 19.15 Arrival back in Amsterdam. 09.00 Free day to explore Amsterdam (at your own cost, depending on what you wish to do). There are over 50 museums in Amsterdam….feel free to visit the one that you like. If you enjoy a glass of beer, join the interactive tour through Heineken, the beer giant’s history in former brewery, with a tasting room finale.Alternately, you can visit the local markets and shop for clogs and souvenirs… or spend time looking at tulips in the flower market. There are many high end boutiques that will make the fashionista in you want to shop more. 08.00 Pick up by luxury mini-coach and transfer to Amsterdam Schiphol Airport. Please note that the above price and itinerary is valid for a group of minimum 7 people. The maximum number of people in the group will not exceed 10. For further details pls fill-up the following Registration Form.